Ask fellow campers about "Denny Creek Campground" and nearby attractions. This is a very attractive Forest Service campground located among giant trees. The host was extremely helpful finding the most suitable site for our large 5th wheel. But there are two shortcomings to note: First, while the sites are large, the layout is such that some campers of differing types are very close together. For example, our neighbor's tent and picnic table were only feet from our trailer. And the big shortcoming: Denny Creek is in a valley between the eastbound and westbound lanes of I-90. There is a 24-hour traffic drone. Sometimes it is gentle like a moderate wind thru the trees. Other times, truck noises make it sound like an 18-wheeler is about to careen through your campsite. The nightly rate is high for a Forest Service campground because it includes an $11/night charge for a 2nd vehicle. We camped at Denny Creek Campground in a Fifth Wheel. This is a beautiful campground not far from Seattle. It is set in the woods in a valley below Snoqualmie Pass and I-90. The camp sites have plenty of space and privacy. There are short hikes to do in the area. Also, unique for a Forest Service campground, it has some electrical hook ups and bathrooms with running water. The highway noise from I-90 is a bit of a bother though, otherwise I'd have rated it higher. The staff was very friendly and helpful. There is wood for sale too. We camped at Denny Creek Campground in a Travel Trailer. Take a short hike up to Franklin Falls. We stayed for three nights at Denny Creek. This was our second time at the campground. It's a beautiful place. The sites are widely spaced, and unlike most National Forest Service campsites, some of them have electricity. The campground is just 50 minutes from downtown Seattle, which makes it a very popular place. I've found my fellow campers there to be very quiet - but maybe that isn't because of the campers. Perhaps it's because of the background hum of the freeway noise that drowns them out. It's constant, but varies in intensity. Sometimes it's a whisper, and then the whisper turns into a roar as a semi driver roars overhead using his compression brakes. The freeway is elevated 100 feet above, while the campground is at the bottom of the valley. There are no RV utilities other than a few sites with 30amp service. There isn't even a sewer dump station. For that you can go to Lake Easton State park about 20 miles east, or Lake Sammamish State Park about 35 miles west. Verizon cell service is okay, but there is no broadcast TV reception. Good luck finding satellite TV, given the dense and shady forest you're unlikely to connect. Still, for some reason I like this campground. 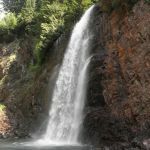 The hikes that start at the campground (Franklin Falls & Denny Creek Slide) are really terrific - and very popular for a good reason. They are easy to moderate difficulty and very beautiful. For a quick 2-3 night getaway close to the city, Denny Creek does okay as long as you can ignore the I-90 traffic noise. Despite the drought, the NFS was still allowing campfires in the fire pits. They didn't overreact like the state parks. I like Denny Creek - I don't love it, but I like it. We camped at Denny Creek Campground in a Travel Trailer. Grocery shopping is available in North Bend - 20 miles from the campground. There are some items available at Snoqualmie Pass gass stations, but they are overpriced. My wife and I just returned from three wonderful nights at Denny Creek campground. Deep in the woods with hiking trails all over. Not only did we ride our bikes, but walked up to Franklin Fall. The trail to Franklin Fall are well maintained mile hike each way. The bathrooms were clean with flush toilets. There are no showers, no RV hook ups other than a few with 30 amp power. Lots of tents and travel trailers all seemed to be a natural fit. Camp fires nightly at each site. We had a pull through site. Needed a bit more leveling, but nothing a block didn't fix. The only reason for a 9 rating was the freeway noise, Denny Creek is between East and West bound I-90 two or three miles from Snoqualmie summit. The park hosts were very nice and went out of their way to help if needed or sell you fire wood if you run out. We ran out. The road into Denny Creek is narrow. We RVed in a 35' rig and a few times cars had to stop or move over just allow us to go by. To be sure, Denny Creek will be a annual trip, just an hour and a half from home. This is a great place to enjoy nature. We camped at Denny Creek Campground in a Motorhome. Just an update on the campground. There is no bridge restriction on Exit 47 anymore. I did not realize that and followed the advice of a previous reviewer and got off on Exit 53 and came in the back way with a very large rig. It was not fun. The campground has 50 amp service in 029, the campsite we are currently occupying. I don't know about rest of sites. I was only expecting 15 amp service so was pleasantly surprised. Very isolated but the hosts are friendly and helpful. There is considerable road noise but not objectionable when inside the camper. North Bend is a wonderful scenic mountain town with all the supplies you will need at normal city prices. Will stay again, but it is not big rig friendly. We camped at Denny Creek Campground in a Fifth Wheel. This is probably one of the most beautiful campgrounds we have stayed in. It is quiet and away from the beaten path. The campsites are large and spread out enough for a little privacy. It is so much fun playing in the river and using the natural "watersides" formed by the river. There is an easy hike to Franklin falls just up from the campground. Only 20 minutes back into North Bend for supplies. Don't miss out on this campground! We camped at Denny Creek Campground in a Motorhome. We are staying here for a week. A couple of nights we will be spending in a room in downtown Seattle. I think otherwise a week here would be too much relaxation for us. The park is deep in the woods and was made to seem even deeper for us because we had to take the long way in due to the bridge that has weight restrictions at exit 47. Our 39ft 5th wheel is at the maximum length of anything I would want to take in here. Be sure your water tanks are full and holding tanks empty before you before you get there. There are many popular and beautiful hiking trails here to explore. The is not even a satellite signal to be had here because of the trees. We camped at Denny Creek Campground in a Fifth Wheel. Denny Creek is a very unusual yet very nice campground. It has 11 electrical sites, which is unusual in Washington for a Forest Service campground. There are three hikes that start at the campground and several more just a few miles away. Snoqualmie Pass, with a hotel, restaurant, gas station and small store is only three miles away. 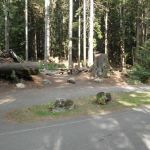 The campground is set in the tall timber with very good privacy between the sites. The one drawback, which is the other unusual fact about the campground, is that it is in the middle of I-90. The eastbound lanes are about 500 feet above the campground and the westbound lanes are across the river again about 500 feet up. You can't see the traffic but you do hear it. Not bad but constant. If you have a site on the river, the sounds of the river may drown out all but the loudest vehicles. There is no dump station on site. 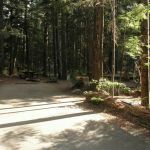 The campground is very well maintained and would have been the perfect "10" with the natural beauty and recreational activities it offers but for the traffic noise. We camped at Denny Creek Campground in a Travel Trailer. 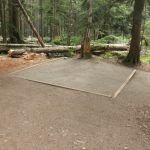 Are you affiliated with Denny Creek Campground ?